One of Russian President Vladimir Putin’s objectives has been to make the Russian Federation an influential player on the world stage after the collapse of the Soviet Union, which he so publicly lamented. This desire drove Russia’s action’s in Syria, to maintain Russian basing options in the Mediterranean and the Middle East. Now that the Syrian conflict is winding down, and Russia’s vassal, Bashar Assad, looks to be safely ensconced in power for the time being, Putin is looking elsewhere for basing rights for Russian military forces. 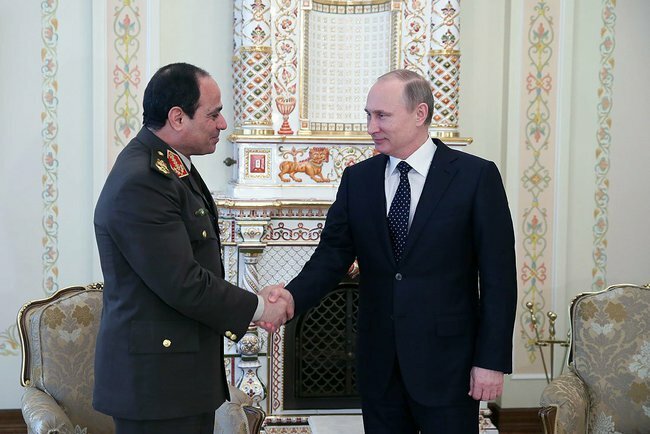 Today Russian Defense Minister Shoigu announced a five year deal for Russian war planes to use Egyptian bases, and vice versa. The agreement is a rebuke to the United States who under the Obama administration pushed for the Muslim Brotherhood, an Islamist supremacy organization, to take power in the influential North African nation. The pro-Jihadi group was eventually removed by the Egyptian military. “Russian Defense Minister Sergei Shoigu visited Cairo on Wednesday, noting that military cooperation between the two countries has increased recently as Egypt placed new orders for Russian weapons. “We are pleased to note stable positive dynamics in the military-technical sphere,” Shoigu was quoted as saying during meeting of an inter-government commission on military-technical cooperation,” reported Associated Press. The President of the Republic of the Sudan Omar Al-Bashir also recently met with Putin in Sochi, Russia and the issue of Russian basing rights in the country was discussed. Russia also has inked a long-term basing deal with Syria for its facilities in the port of Tartus and several airfields, including the facility at Khmeimim near Latakia. Putin has also shown an interest in Venezuela, where the socialist regime has destroyed one of the richest countries in the world, awash with hydrocarbons. Russia just kicked the can down the road on a debt restructuring with the Kremlin, where the payments are lumped at the end of a ten year period. The opportunity for Russia to establish a beach head for Russian forces in Latin America is attractive to Putin. Russia may very well negotiate basing rights as payment of monies owed for previous loans to Caracas.